As can be read in the magazine, Here, interviewee DJ D-Wayne explains what makes him feel at home while being away on tour for a long time. One of the things he always asks for in his hotel room is a carpet. 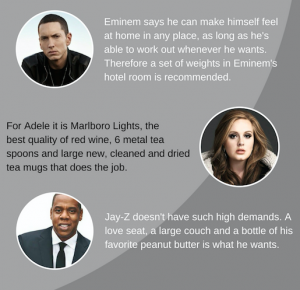 Especially for you, we made a list of some celebrities and their demands to make themselves feel more at home while being away. You thought asking for a carpet is weird? Think again, these celebrities prove the most weirdest things can make us feel at home.